Product #17513 | SKU SR8A4 | 0.0 (no ratings yet) Thanks for your rating! 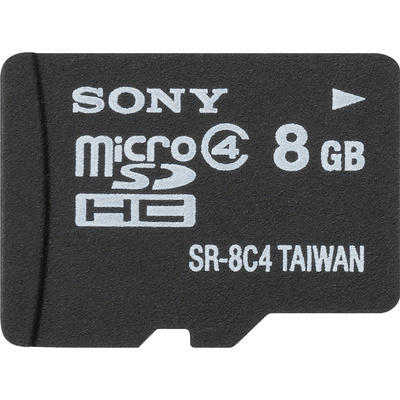 The Sony 8GB microSDHC Memory Card with microSD Adapter is a micro-sized Secure Digital High Capacity memory solution. It can be used in mobile phones and a variety of other portable media devices. This microSD card provides 8GB of data storage capacity, and is ideal for use in storing media-rich files such as music, videos, and photographs. A microSD adapter is included, allowing you to use this card in full-size SD slots. Transfer data from your mobile device to your computer by insertion into an SD card slot or via a card reader (not included). The card's Class 4 rating gives you minimum read and write speeds of 4MB/s. Downloadable File Rescue software enables you to recover photos and videos that have been damaged or erased. The software is only compatible with Windows XP or later. Can be used in mobile phones and a variety of other portable media devices. Provides 8GB of data storage capacity and is ideal for use in storing media-rich files such as music, videos, and photographs. A microSD adapter is included, allowing you to use this card in full-size SD slots. Transfer data from your mobile device to your computer by insertion into an SD card slot or via a card reader (not included). The card's Class 4 rating gives you minimum read and write speeds of 4MB/s. Downloadable File Rescue software enables you to recover photos and videos that have been damaged or erased. The software is only compatible with Windows XP or later. Read Speed 4.0 MB/s min. Write Speed 4.0 MB/s min.